SecureNinja's MCSA: Windows Server 2016 nine-day (9) certification boot camp in Washington, DC and San Diego, CA will provide students a full understanding of the Windows Server 2016 environment. During the training course, you will take three (3) exams enabling you to attain the Microsoft Certified Solutions Associate. 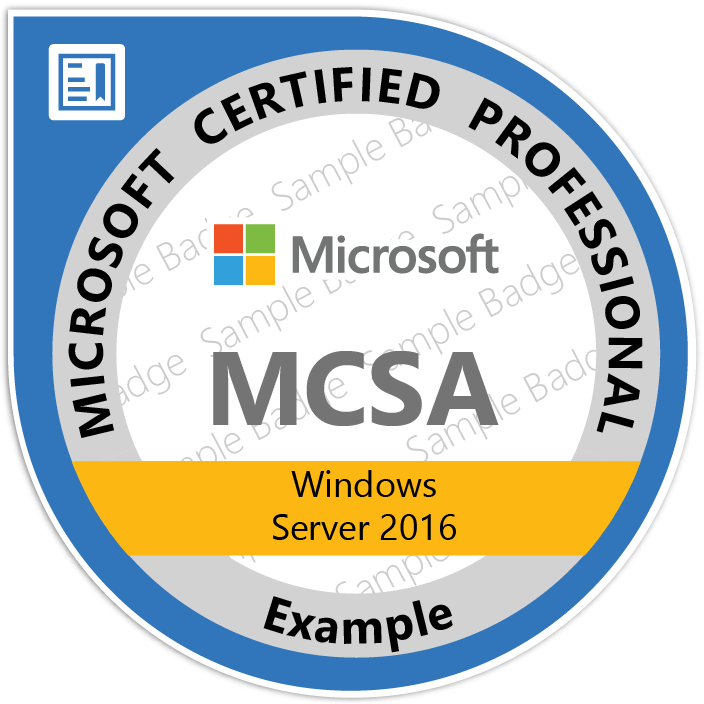 The Microsoft Certified Solutions Associate (MCSA): Windows Server 2016 certification shows that you have the primary set of Windows Server skills that are relevant across multiple solution areas in a business environment. Exam: 70-740 - This exam focuses primarily on the installation, storage, and compute features and functionality available in Windows Server 2016. It covers general installation tasks and considerations and the installation and configuration of Nano Server, in addition to the creation and management of images for deployment. It also covers local and server storage solutions, including the configuration of disks and volumes, Data Deduplication, High Availability, Disaster Recovery, Storage Spaces Direct, and Failover Clustering solutions. The exam also covers Hyper-V and containers, along with the maintenance and monitoring of servers in physical and compute environments. Candidates for this exam are involved with the installation, storage, and compute functionalities available in Windows Server 2016. Candidates perform general installation tasks, including installing and configuring Nano Server, as well as creating and managing images for deployment. Exam: 70-741- This exam focuses on the networking features and functionality available in Windows Server 2016. It covers DNS, DHCP, and IPAM implementations, in addition to remote access solutions, such as VPN and Direct Access. It also covers DFS and BranchCache solutions, high-performance network features and functionality, and implementation of software-defined networking (SDN) solutions, such as Hyper-V Network Virtualization (HNV) and Network Controller. Candidates should also have experience managing DFS and branch cache solutions, configuring high-performance network features and functionality, and implementing Software Defined Networking (SDN) solutions such as Hyper-V Network Virtualization (HNV) and Network Controller. Exam: 70-742 - This exam focuses on the identity functionality in Windows Server 2016. It covers the installation and configuration of Active Directory Domain Services (AD DS), in addition to Group Policy implementation for non-Nano Server environments. It also covers functionality such as Active Directory Certificate Services (AD CS), Active Directory Federations Services (AD FS), and Web Application proxy implementations. Washington, DC is our Home. Most training centers set up shop in hotels or rented centers. When you have a need, request or encounter a problem they are not there to answer. Our physical location in Alexandria is open 7 days a week and our staff is always there to help.